Ages 18 and under can participate! To demonstrate your talent, fill out an application HERE. 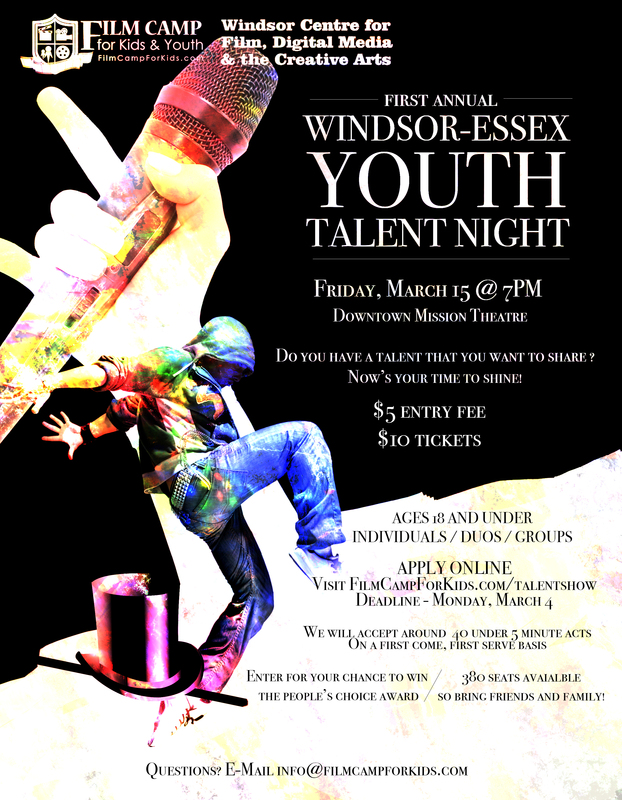 Once we have approved your application, the next thing you have to do is show up the night of the talent show! Participants should show up early at 6:30. You will be given a number, and that will be the order in which you will perform. Be sure to send us any supporting material (music, etc.) by March 8th at the latest. NOTE: All acts must be approved by Film Camp for Kids & Youth (including choice of song, scene performance, etc.) Acts must be family friendly (i.e. no inappropriate content). Yes! There will be a People’s Choice Award which spectators will vote on — so be sure to bring family and friends! The theatre can hold up to 380 seats, and we are expecting around 40 acts. E-mail info@filmcampforkids.com to reserve your tickets. Pay via Interac, cash, or cheque. I DO NOT WANT TO PERFORM, BUT WOULD LIKE TO VOLUNTEER– CAN I? Yes! We will need volunteers to take tickets, serve refreshments, greet guests, as stagehands, and more!